Visit Jeep for more information on the Jeep Grand Cherokee SRT8..
Dimensions and capacities are in inches (mm) unless otherwise specified. (a) Turning diameter is measured at the outside of the tires at curb height. Turning diameters and steering wheel turns, lock-to-lock, may differ with optional tires and wheels. (a) For towing heavier trailers up to the Maximum Trailer Weight Ratings shown in the Trailer Towing chart, the vehicle must be equipped with the Trailer Tow Group Class IV for the 6.4-liter engine for North America. 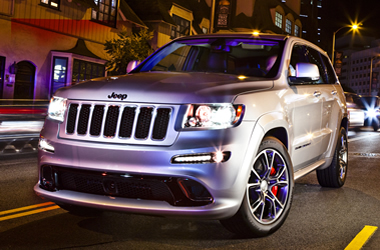 Get a Price Quote on a 2012 Jeep Grand Cherokee SRT8.